YARAT Contemporary Art Space launches a new painting master class for adults as part of the exhibition "Labour, Leisure and Dreams: 1960s-1980s through the eyes of Azerbaijani masters". A master class "Explore Yourself" will take place at the Museum of 20th-21st Century Azerbaijani Painting this July. "Explore Yourself" is a bright, interesting, fascinating event, saturated with the atmosphere of creativity. The master class will help forget about everyday life and surrender to creativity. 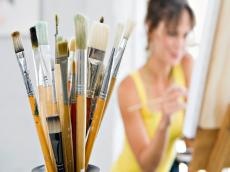 Every participant will receive a canvas, brushes and paints, and professional artists will tell and teach you various art techniques and styles. Even if you are holding a brush for the first time, you will be able to discover new horizons of your creative potential with the advice of leading artists. The master class is a completely new kind of pastime, ideal for friend groups, family evenings and all who would like to express their feelings through the canvas and paints. Master classes will be held every Wednesday from 19:00 to 21:00. All materials to be provided. The Museum of 20th-21st Century Azerbaijani Painting was founded by the Heydar Aliyev Foundation. The museum was inaugurated in June 2015 by the President of Azerbaijan, Ilham Aliyev and the First Lady of Azerbaijan Mehriban Aliyeva.